When anxiety or a panic attack hits, your heart rate spikes. Your breathing becomes shallow. You may start to sweat or shake. You might worry that your next breath will be your last. Or perhaps, you live with a constant low-grade fear of the future. If you’re one of the more than 40 million Americans who live with an anxiety disorder, these feelings are familiar. Anxiety is one of the most common mental health disorders affecting Americans today. The intrusive and irrational fears disrupt your attendance at work and school. It can stop you from developing relationships with colleagues and friends. Anxiety causes uncomfortable physical side effects ranging from headaches and sweating to severe digestive problems. There are many different types of anxiety disorder including generalized anxiety disorder, panic disorder, and social anxiety disorder. Generalized anxiety disorder is the most widespread form of anxiety. It causes intense fears about everyday situations such as completing chores or the health of your family. Panic disorder causes panic attacks, in which sudden bouts of extreme fear emerge with a variety of physical symptoms including heart palpitations, rapid respiration, shaking, sweating, and crying. Social anxiety disorder is also very common, causing irrational fears of rejection and humiliation in social settings. Your fears prevent you from comfortable social interactions with strangers, work colleagues, and even friends and family members. Fortunately, anxiety is treatable. Working with one of the licensed and compassionate therapists at North Brooklyn Therapy can help you learn to recognize your anxious thoughts and feelings, and adjust your behavioral responses. For example, many patients benefit from cognitive behavioral therapy, which helps you develop the skills to identify anxious and fearful emotions and control your response to those feelings. You may also benefit from practicing mindfulness, a meditative practice that helps you stay focused on the present moment instead of worrying about the future. In addition to working with a therapist, you can take steps at home to manage your symptoms and enhance your quality of life. As much as you love your morning — let’s be honest, any time of day — cup of coffee, caffeine is a stimulant that can amplify your anxiety symptoms. While herbal tea is no substitute for a strong cuppa joe, hot drinks like peppermint tea can provide a caffeine-free boost to get you through your 3pm slump and chamomile tea is known for its relaxing properties. Speaking of mint or chamomile, you could also diffuse relaxing scents. Essential oils such as lavender, chamomile, and bergamot can help you relax while citrus and mint oils can lift your overall mood. Diffusers use steam to send the relaxing fragrances through your home. Alternatively, if you want to benefit from aromatherapy at work or outside of your home, you could wear a diffuser pendant or bracelet. You also can mix essential oils with carrier oils and apply them to your skin. Exercise burns off negative feelings and calories. If you find that your thoughts are racing out of control, even 20 minutes of exercise could help calm your mind. Exercise releases endorphins — your feel good hormones — which can help calm your mind and make you feel more positive overall. Adult coloring books are more popular than ever. 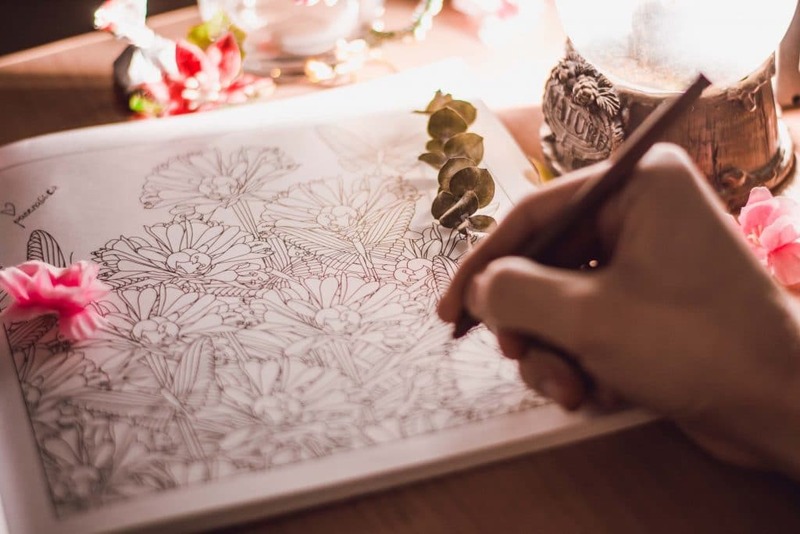 When you focus on coloring in intricate designs or working on any craft-based hobby, your mind enters a relaxed state that’s very similar to meditation. This distracts you from your intrusive anxious thoughts and worries. So if coloring isn’t for you, try knitting, needlepoint, or whatever arts or crafts project appeals to you. Everyone says to just breathe, and while it’s a cliche, take time out to take a few deep breaths and focus on filling and expanding your lungs before fully exhaling the used up air. You could imagine exhaling your negative thoughts and feelings. Sometimes fears are founded in reality, but you need to take time to think about your feelings and determine if there is a legitimate reason. For example, if you know that the company you work for is downsizing, you may be right to feel nervous. But, when your fears are founded, you can usually take action to relieve or resolve the issue, such as searching for a new job if you know that your current position could be at risk. If anxiety is disrupting your life, help is available. Call North Brooklyn Therapy to schedule an appointment with one of the compassionate licensed therapists today.